Conditioned by nowadays work environments, many people prefer simple ear plugs to wear at the job in order to disguise the real size of their stretched earlobes. The mainly free top of an ear plug gives the opportunity for endless colours, designs and 3D shapes. That's why we chose to section our shop into a few main categories. For some items you may discover single overlaps. We strive to offer the biggest amount of plugs. If there is still anything missing, don't hesitate to let us know. We are always interested in news ideas. 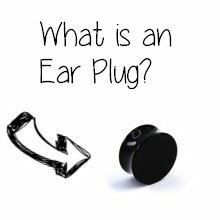 What does ear plug mean? Formerly, ear plugs were only known as small foam plugs you tucked into your ear as protection from loud construction noises or snoring bed neighbours. Nowadays, ear plugs got a new meaning as trendy fashion accessory. Ear plugs, also known as tunnel plugs or flesh ear plugs are body piercings which get "plugged" into the stretched earlobe. This is the main difference compared to regular earrings. Although both are worn in the ear, ear plugs require much more initial preparation time. In order to wear ear plugs, you need to carefully stretch your pierced cut first by using ear stretchers or ear expanders. There are ear plugs with internal and external threads as well as flared plugs without any thread. These plugs simply stay in their place because of their convenient shape. The midst of the plug is quite thin while the outer lips are a little wider. This creates a hyperbolic plug. You better not use them shortly after the stretching procedure. This could cause some trouble because of the broad edges possibly inflicting pain or emerging blood. A third plug shape is the straight plug. It has a cylindrical shape and includes so called "o-rings". Last but not least you can also discover triangular or square ear plugs. The basics for flesh tunnels and ear plugs are much the same. You need a pierced earlobe in order to stretch it. Therefore time and endurance are key components. Take some moments to balance the PRO's and CON's of this future decision. If you have decided towards a pierced earlobe, please don't start stretching within the first 4 to 6 weeks after your newly pierced cut. Designated stretching equipment like straight expanders or enlarging crescents help you meet your goals. Please don't use improperly tools you may find interesting to use as stretchers. Expanders like the ones in our shop are especially designed and fabricated to preserve the health of your skin. Separate to your final decision, it is important to check whether your accessory is disinfected. More information can be found in our blog. Anyone believing in ear plugs as a contemporary trend is clearly mistaken. The origin may not be able to be exactly determined but it is known that stretched earlobes were already popular in ancient Egypt. The incas as a well developed culture also had a preference for gold and silver plated ear plugs. They mainly functioned as symbols of power and social status. Africa as another continent with a big cultural diversity holds some interested approaches in terms of body modification. An extreme form can be found among the Ethiopian tribe of the Mursi. The young women of Mursi are famous for wearing huge plug plates in their bottom lip. This is achieved by a slice in the lip. Afterwards a wooden plate plug is placed in the wound. The bigger the plate the more respect a woman will get. This is because of the outstanding beauty ideal the Mursi embrace. At the end of the 19th century ear plugs also established in the western world. The enduring interest in body modification concluded resulted in an unending wave of new colours, designs, materials and shapes. Ear plugs out of surgical steel 316L are far less demanded then flesh tunnels. The reason may occur in the bigger weight it can achieve at certain sizes. That's why you often find plugs with extra shapes and details like crystals or glass. Steel plugs are especially interesting for beginners. The smooth surface gives your jewellery a straight look and simplifies unpleasant cleaning routines. Surgical steel was developed for the usage in sterile environments. The defence of external damages, reduced skin friction and the difficulties for sweat, contaminants and bacteria to persist, speak for the material. Acrylic ear plugs are known to be affordable and diverse in style. The adaption of new shapes like triangles and squares can be achieved through the manufacturing process of molding. The light weight facilitates a good wearing comfort. Possible infections with bacteria are hold back by the smooth surface. People suffering from allergies can trust in acrylic items to be nickel-free and therefore especially fitting. The use of aggressive cleansers is not advised. One thing silicone is famous for is its great wearing comfort. The softness and flexibility make you enjoy silicone ear plugs for a long time. The material is nickel-free and therefore a good alternative in terms of allergy suffering. A problem that might occur is a possible complication during the healing process. Since the material is not breathable you better not wear it while the pierced skin is recovering. All in all silicone is a tried and tested plug material that fits both your requirements and wallet. An organic material like wood perfectly combines several demands and wishes, piercing fans have. Wooden plugs are highly breathable. A bad smell other materials can enfold isn't the case. This makes wood a strong attendant for certain environments like the work place. The wood species we choose for production are also pretty light. So it may be a fine option for your sized earlobes. The uniqueness origin of each item caused by an organic is a completing argument towards wooden plugs. It seems pretty crazy we turn a material from the inside to a fashion accessory on the outside of our bodies. But this is what happened for quite some time throughout human existence. There are good reasons for that. The ruggedness helps you withstand some tough situations. Bones consist of unique textures. It may support your demands for an individual piece of jewellery. The dim appeal of horn can give you quite a notably style. Worn by tribes for thousands of year, it also found its way in the western body modification scene. The light structure and a hard surface at the same time present two noticeable benefits. 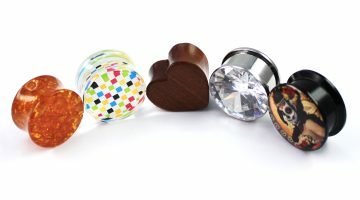 Our shop includes a fine selection of glass made plugs. The glass used is a completely inorganic material which is created in the melting procedure of certain quartz crystals, chalk and oxides. This origin makes the plugs non-sensitive to environmental influences or chemicals. The even surface reduces a possible skin rubbing and inflicts a nice feeling while wearing. When talking of stone made ear plugs there is clearly more to it than meets the eye. Stone as a completely organic resource is free of synthetic or chemical compounds. The material makes every item resistant to most external influences and invites you to stress its possibilities. The only main downside is the weight. In case of too much weight bearing, your earlobe might deform. Please don't wear stone ear plugs on a continuous basis or use them as an initial plug after stretching.